Minister for Communications, Climate Action and Environment, Denis Naughten, accompanied by the Minister for Rural and Community Development, Michael Ring, launched the 2018 National Spring Clean at a clean-up event last Thursday. 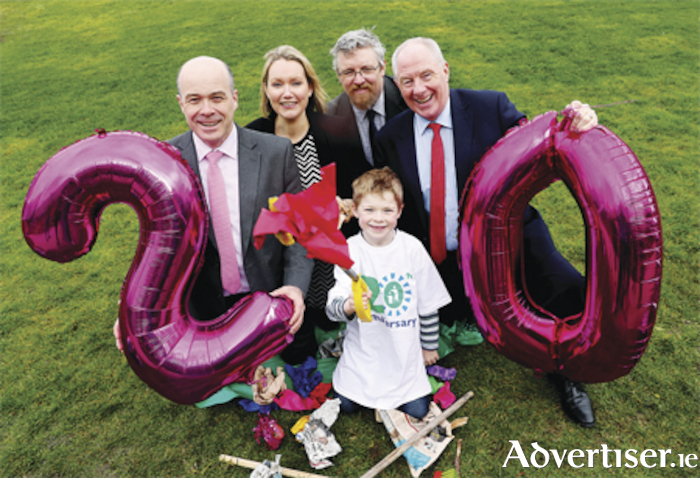 Celebrating its 20th anniversary, the campaign runs throughout the month of April, and calls on communities to register for clean-up activities across Ireland. The initiative is organised by An Taisce, supported by the Department of Communications, Climate Action and Environment, and sponsored by the Wrigley Company. In 20 years, The National Spring Clean has collected more than 33,000 tonnes of rubbish, the same mass as 1,685 double decker buses. It has organised in excess of 70,000 clean ups, and has collected the equivalent of 4.8kg per participant. Volunteers have contributed more than 10 million hours to the initiative. Speaking at the launch, Minister Naughten said: “The leadership role that the National Spring Clean continues to play in Ireland’s fight against litter is acknowledged and recognized by me and my Department. I applaud the outstanding work that the National Spring Clean campaign encourages by groups and individuals, schools and workplaces. In its 20th year, the National Spring Clean sends a nationwide message to all communities of the collective responsibility we share in tackling our national litter problem. The National Spring Clean encourages individuals and groups such as schools, local authorities, voluntary groups, businesses and community groups to get involved in local clean-up events. By participating in organised clean-ups, people of all ages come together to make a positive contribution to the communities in which they live and work. All clean up groups registering with the National Spring Clean campaign receive a FREE clean-up kit comprising information, posters, colour coded refuse sacks for segregation of waste materials, protective gloves and tabards to keep participants clean.